Understanding clay mineral intercalation is the aim of this chapter. Intercalation, which corresponds to a reversible inclusion of different species between two layers, depends on the geometrical, physical and chemical characteristics of each type of clay mineral. 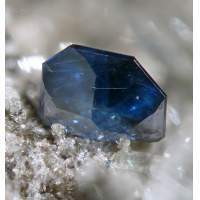 In most phyllosilicates, the interlayer space is occupied by cations which are more or less hydrated. These water molecules which separate two successive layers enable further intercalation reactions by physical adsorption or by chemical grafting of a great variety of species. It is noteworthy that intercalation of inorganic or organic species by ion exchange of these interlayer cations is often the first step in intercalation and is of primary importance in much basic and applied research of the modified clay minerals obtained. This concerns organo-clay minerals (OC), pillared clays (PILC) and clay mineral-polymer nanocomposites (CPN). In non-swelling clay minerals where, generally, the interlayer space is empty, the layers are held by van der Waals interactions or by hydrogen bonds between the stacked layers. In this case, different mechanisms of intercalation can occur and are described. X-ray diffraction (XRD) and adsorption methods, which induce swelling, and how they are used to confirm intercalation are described below. The meanings of the commonly used terms ‘intercalated’ and ‘exfoliated structures’ in CPN literature and the meanings of the confusing terms, ‘exfoliation’ and ‘delamination’, are also discussed. When the reversibility of the intercalation can be controlled, applications become possible. In conclusion, this chapter aims to draw attention to the importance of the geometrical arrangement of the different clay mineral units in predicting their properties. The unique intercalation property of clay minerals allows us to consider possible further development in aid of our environment, our health and our wellbeing.